I wrote this small piece as tips for SEO for a friend of mine while she was working at a firm. Althought there’s a lot to be learnt beyond this document, you may like to refer to it as your first steps towards SEO or Search engine Optimization. Good Luck for your Web Analytics Career! Click on it to download. Google Tag Manager – Just an introduction. No more, No less! So you want to Manage Tags? Your website is cluttered with all kinds of tags, recent and old. You do not know what is a tag? Ok. A tag is just a trained parrot! As soon as the parrot sees something it knows or taught to know, it calls your name. There are many such parrots in your website who shout based on various events that may occur. Google Parrot Manager, oops, Google tag manager manages those parrots or Tags!!! Just an anecdote : I struggled hard to understand what exactly is a tag initially! I mean I knew tags in real life but not from the perspective of Google Tag Manager or GTM. So, I made up this parrot story to help you understand what it is. Back to the parrot story. So, the parrots helps us manage and keep track of the various activities occurring in our website. But who will control so many parrots? They may fly away or in plain words, just will become unmanageable. So, see how important GTM is! Done. No more parrots and only tags instead. Every single tag needs a trigger to fire. This trigger gets active on an Event like Click and submission of a Form. We configure the Tag by mentioning the Category , Action and Event for the Tag which can be customized by the implementation planner. It is based on the KIND of click that the three parameters are determined. 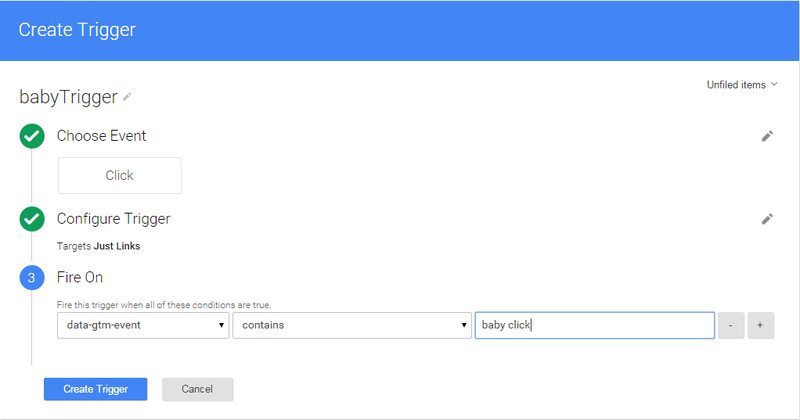 For example, in this case the category could be a string called babies, action could be baby click and label could be the value of data-gtm-info. Also, we specify the trigger that would fire the tag. The trigger is based on an event. So, we go to ‘Create Trigger’ section to create one with a custom name. There we add the event which could be a single condition or a combination of conditions. There can be more than one trigger for the same tag specifying that multiple events can be capable of firing a single tag during various situations. In a scenario where a Rat Dies is the tag. It may die due to a heart attack, or being eaten by a cat!!! These will be two different triggers to fire the same tag. See. How convenient huh! Once the trigger has been created we can complete the creation of the tag. I am adding a pictorial representation of tag creation taken from my GTM account. Please note that this is a dummy example.